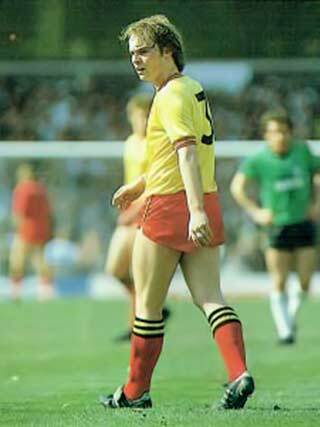 Tough tackling left-back Neil played less than twenty games for Watford yet they included some of the biggest games in the club’s history, including UEFA cup games, an FA Cup Semi-Final and the FA Cup Final. He eventually left the club to join Swansea City, but more recently has co-commentated on Watford games for Three Counties, run the Red Lion Pub, and also set up the Former Players Association. Neil spoke to Watford Legends just before the World Cup in 2018. Thanks for talking to Watford Legends. How did you become a Hornet? I was thirteen and I was spotted of course by Tom Walley, playing for West Herts District Schools. That was down at Hemel school. I can’t remember the score but he came to see me after the game and asked if I wanted to come training on what was then Monday and Thursday nights at Woodside Leisure Centre. That was all you could do at 13. At 14 they made a decision on you, after seeing you in training and a few small games, to sign you on schoolboy forms and that took you up to 16. That meant you could go down there in school holidays and fully integrate yourself in the football club. And then you became an apprentice at 16? Yeah, I was playing in the youth team when I was at school. So for that whole year at 15/16, I wasn’t 16 until the February, I played every game. We played on the pitch at Woodside. And I also played three Reserve games right at the end of that year in the old midweek league. I can’t remember everyone we played, but I remember we played at Northampton because they only had three sides to the ground. For me it was great, it integrated me really well. I knew the apprentices from the year above and above that. The likes of Steve Terry, Cally, Kenny Jackett were two years above me so they were playing in the youth team. They all played with me forever really, I caught the end of them. Then the Reserve team were pretty good, I got to know the older lads who were leaving, the likes of Keith Mercer, Trevor How, Sam Ellis, John Ward. I knew a lot of them lads. It really integrated me for the time I became an apprentice which was June or July 1980. It was a smooth transition for me. You made your debut in a Football League Trophy game in late 1982. Do you count that as your first team debut, or the European game the following year? Yeah it was. It was the old Freight Rover Trophy, Leyland DAF Trophy or whatever that used to be. It was a bit of a baptism of fire, as my games always were – I never got chucked into easy games. Story of my life at the football club really! We played Reading and Kerry Dixon was emerging. I went on with about 25 minutes to go I think, you know, lovely little debut. And Kerry Dixon scored a hat-trick, and run rings around Steve Sims, and he said that’s probably the worst evening he’d ever had in his career. I think they beat us after extra-time. But it was a really good game and a good debut for me and I enjoyed it. 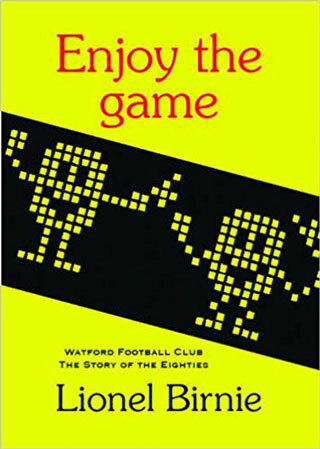 You played most of your Watford games in season 1983-4, but that included a lot of big games – Luton home and away, Arsenal home and away, Manchester United home, and the UEFA cup games in Sofia and Prague. GT obviously trusted you? Ha yeah cup semi-final, final as well! I got to know Graham very well when I went back to the football club to set up the Players Association in around 2008 or 2009. We were transitioning from the old Camelot park back up to the ground when they were doing the offices. Every department had a hospitality box, and Graham was then the chairman. Me and him used to sit outside his box and I got to know him as a man rather than a boy if you know what I mean. And we chatted about that and he agreed he was really unfair on me. He said to me it was really tough on you and I didn’t really give you a full shot. When I left Watford and went on to other clubs, for a long time I was frustrated more than angry, but there was a little anger in there, because I felt I got chucked in at the deep end at every opportunity. And even he admitted to me that was the case and he possibly didn’t blood me right, he should have let me have some games. I had a fantastic time with a fantastic manager in a fantastic era. I was privileged to be part of that. But Graham admitted he could have handled me a little bit better and in the end it curtailed my time at the football club because I was judged on bigger games and I wasn’t allowed to have a not so important game. And that’s really quite tough isn’t it?! You mentioned the Cup Final and in that game you were up against Trevor Steven who would go on to become an England international. And then you didn’t get a look-in the following season. He (GT) used to say to me, you never let me down. Me and Graham had a really good relationship. He used to like me. I was from Hemel, I was raw. I’m not slagging off Hemel but it’s a raw place isn’t it?! I was down to earth, from a council house, I had my heart on my sleeve, would sweat blood and tears for the football club. Probably a little too enthusiastic and exuberant at times, got a few red cards which I shouldn’t have done. Ultimately he knew he could rely on me and knew I would go out and give my best and you can’t ask for more than that. If that’s my legacy with Graham, then that’s not bad is it? But I’ve had to mature to see that. You went to Blackpool on loan under Sam Ellis? Yeah I had a great time with Sam, we got promoted, we finished second or third I think. I went there and had a fantastic time, what a place to be a young man eh?! It was a good old-fashioned club, northern support which is very vocal. They offered me a contract, I should have taken it at the time but didn’t. He offered me two years but I wanted more than that and I went to Swansea under John Bond and got a massive pay-rise. I was turned a little bit by the money, but it’s a fantastic club, I love Swansea as a club and as a town. It didn’t really work out for me to be honest. There is one big reason. We went on a preseason tour to Kuala Lumpur and played in a tournament against a Korean national team, and I think the Philippines and Malaysian national teams. Eighty thousand people in the stadium. You know how the medical side of things was back then, we were losing half a stone in a game and not rehydrating. We’d be doing preseason training and heading out at 10.30 in the morning. Kids would be stopping in the street and watching us go out and laughing. The Koreans and the Malaysians would be going out at 5 in the morning and back by 8. I’ll tell you a really good story actually, in one of the games, we came in at half time leading. I went and sat in the dressing room and peed myself. I was delirious. The heat, the humidity, it was July, can you imagine it? We were leading in every game and ended up drawing them all. We didn’t refuel properly, we didn’t rehydrate properly. No water during the games. The lads would just go out and have a few beers to rehydrate, that’s the worst thing you can do. It was a really bad tour for all of us. I got a really bad chest infection which left me needing like asthma pumps. I had three months where I couldn’t do anything, I couldn’t even get out of an armchair. I got back, and then to be honest, I was ill, I wanted to be with my family, it just went from there really. I was getting up in the morning and coughing and sneezing and having tests. It had an effect on me for the next two or three years. You had a spell at Wycombe afterwards, was it still affecting you then? I could deal with that football. I went and played at Wycombe and then went into the non-league game and I was really successful to be honest. I’m still on the wall at Wycombe, my daughter went and played there the other day for Wycombe Ladies and she’s picked me out with a mullet on the wall, before it all finally left me! I went and played Conference South football, we were all being paid a nice bit of money, got promotions, very successful. Then I went on the management trail and was successful with that as well. I got to the First Round of the FA Cup with Hendon and Walton & Hersham, and played Swansea and Cardiff. I then went to Hemel, got record points and basically their ground grading was rubbish so they couldn’t go up. And I fell out of love with it to be honest. I had three children, I’d got divorced and I was making a life for myself really. I’ve kept in touch. It’s either been football or property with me, that’s what I’ve done. I’ve just bought a barn in Cornwall actually, I’m going to retire down there. I’ve kept my hand in, I did the radio for about eight or nine years. Yeah it’s really funny, I got a call out of the blue from BBC Three Counties, never spoken to them before. They had this game they wanted me to do and whether I was up for it. And I thought, yeah I’ll do that…what game is it? It’s the play-off final. That was the first one you did? I’d never spoken on the radio. Ever. He said to me it’s the Watford play-off game. Just a small one then. I really enjoyed that to be honest, and it went really well. I got a few opportunities, I used to do Talksport as well. I had a few opportunities to pursue a media career, but it never fitted in with what I was doing workwise. I couldn’t give up my job because when you start the money’s not that great. Then I worked with Marco Tardelli for five years, you remember him? Marco’s a great man. I worked in football agency for five years. He was the agent and he was the one that knew everybody. We brought some players over and did that for a few years until that all went a bit wild west. And then it was back to property. I remember the commentary in the play-off final. 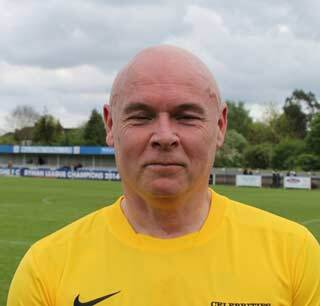 You had an argument with Simon Oxley over whether it was an own goal or not. Yeah we all thought he’d put it in, that’s what we saw. I saw him last week at a charity game. I was winding him up. What were your thoughts about the team at that time under Aidy Boothroyd? No, I didn’t. Me and him never got on, only because I said what I thought, which I’m always going to do. Which sometimes is good, and sometimes is bad, I get that. But Watford’s my football club, it’s in my heart, it’s what I am. So to see them go up was great. I was talking to someone about England the other day with the centre-halves and Jordan Henderson having all the touches on the ball. Why are we doing that? I’ve got nothing against Jordan Henderson but if you look at the stats, 80% of his passes or something go to the full back or centre-half. No wonder his pass completion rate is so high. Compare with someone like Shelvey who plays forward looking passes. Against the weaker teams, why don’t we just get the ball in their box, squeeze up in an area where they’re not as good as we are? Is that too simplistic? We’ve got really good players in the final third, why don’t we get players in behind and round the sides of teams. The weaker opponents don’t want it in and around their box. And what we do is the opposite and sit there until the 85th minute. That’s probably the Graham legacy I think! Did you feel Boothroyd’s football was not the same as they way you used to play under GT? People used to say Graham’s football was kick and rush. The first thing he told me to do as a left-back when our ‘keeper had the ball was to hit the touchline. When we had the ball, Barnesy used to come short. Him and Cally had to work their socks off. So you’d play the ball to him, get it back, and then clip the ball into the channel. Up front, they’d work their socks off, do their crossover runs. The ball in the last third was then, with quality, put into people’s feet. They would hold it, Barnesy would then have got forward, the two midfielders would have pushed up, the ball would go in the box and the far winger would have to track the back post. So what you’ve got is balls going into the box with quality, in the right areas, with not that many passes and we’re actually playing mostly in the other team’s last third. Now for me, that is quality, exciting football, and you’re going to see lots of goals. Boothroyd just belted it. His philosophy was help it back in the box and it bounces up and anything can happen. Completely different to Graham. It’s interesting to hear because obviously you saw a lot of the games under Boothroyd but played under Graham. When Boothroyd came to the club, he was a really nice man. By the time he left the club, he was absolutely the emperor’s new clothes. I remember going to this meeting and they said Watford were going to be a top five side. I was there and I was actually biting my fist. What was coming out was like someone who’d completely lost their head. He seemed to get into this fairy land that it was all about him. I think that’s where he went wrong. In the end he believed his own hype. You also founded the former Players association. How did that come about? It’s funny really, I’d had the idea for a long time about former players. I mean, the PFA is good, but it’s become a really elitist system. I get the membership stuff through the door, you get discounts here and there, but I haven’t got the money to buy a Brietling watch or a £3 million house in Cuba! So I was thinking what happens to Billy Smith who plays for Scunthorpe for ten years, he’s not really made any good money? There’s nothing I can do for him, but I thought I could do something for the boys I know. I’m going to get us all back together, make sure we know each other, we’re going to raise some money for charity, and I’m going to put this football club back where it should be, with the family supporter caring face it had. I felt around that time that football was going in the opposite direction, the supporters were getting treated really badly, there was no link between players and supporters at any football club anymore, lots of the players were foreign, and lots were not engaging with anybody. I rang Graham and asked him what he thought. He said I don’t believe it, I have had this idea since the 80s, but have never had enough time to do it. There’s lots of players I’d like to help. I think he knew there were a lot of players where he’d been harsh. In the 80s he was very driven. The man you saw in the 90s and the 00s was the kind, friendly uncle of the man in the 80s if you know what I mean? I had lots of conversations with Graham. Every time I brought players back, he’d want to know who it was on the Friday so he’d call me in and ask who’d we’d got coming in. I’d always take the players up to see the gaffer. One day I got Ross Jenkins back, and he was like, “oh my god, how was he?”, and I was like he’s fine, shall I bring him up? And he was like, just judge it, because I didn’t treat him that well when he left. So I said ok I’ll come up first and give you the lowdown. In the end it was quite nice, they had a cuddle and a cry. Ross was quite overwhelmed, he’d never been brought back, Watford had never had anything like that before and it was really quite moving. Graham was very aware of how driven he was and perhaps could have treated a few people a bit better and felt he wanted to give a bit back. So he said I can’t promise you anything but I’ll give you a desk, you can use our phones and see if you can get it off the ground. If you need me for anything, I’m only down the hallway, give me a shout. After about three months he said we can put you in hospitality and kill two birds with one stone. So we just pushed it on from there. It was a time of no money for the football club, we lurched from pillar to post, we nearly went bust a few times, there was the Russo thing, we were finishing down the bottom with Barnsley below us and getting nine or ten thousand in the ground. It was really tough. But we had a great time and really pushed that on. It all went a little bit different when the Pozzos came in. Yeah, I’m still the founder. We get support and a nice fund for former players and do the charity thing. My philosophy is like this. Bigger clubs than us do very well by their former players, they make them ambassadors, they roll them out, give them something back. Watford don’t seem to want to do that too much. I’m not saying they’re bad, they help. I just think at Watford we could be a bit more like the bigger clubs. With all the money in the game now, it wouldn’t hurt to make it an all singing, all dancing former player’s association for the benefit of everybody. We had the golf day yesterday, four or five of the lads came back and we weren’t really involved as an association. So I’m still fighting, I’m still there, we do bits and pieces and trying to get stuff off the ground. I just think we could go a little bit further and it would be nice if it was part of Graham’s legacy really. He was very passionate about it. We’re a small to medium sized suburban club really, our USP is engagement, family club and community. We do some great work with the trust, they are fantastic. But as players aren’t going to engage these days, wouldn’t it be nice if we could engage through the former players’ association? I’m very passionate about it and feel we could do more for that. It fits in with the DNA and ethos of the club. I don’t think the DNA is to make every single penny out of every single thing. At the end of the day, the Pozzos have been absolutely fantastic. Look at the stadium, look at where we’ve come. I just think that sometimes you have to look beyond money and stuff and what you’re actually doing. Some of our older lads have had some horrendous injuries, down on their luck and things like that, and it would be nice to be able to do something for them if we need to. Maybe the club could employ them as ambassadors or something. Wouldn’t it be great to have six or seven players constantly at home games, maybe in the shop or the hospitality or in the Rookery Bar. Remember in the really skint days, around 09/10. We were struggling to sell season tickets. We had a legends day and I got about 16 legends back. I had them in the Rookery bar, I had them selling tickets, giving out vouchers for half season tickets. That was my vision, but I can’t do it on my own and I need them to buy into it. Once I wasn’t at the club every day, and obviously now Graham’s gone as well, the progress we made has stuttered. My vision for the pub up the top of the road was very much for it to be a supporters club. Do you remember the old supporters club? No, a bit before my time! We used to go in there as apprentices. The lady who used to run it with her husband used to make us sandwiches and drinks at lunchtime. She was like our mum really. It was a great place, the players used to go in there, even Elton used to go in there. Supporters would be in there and there’s Elton having a sandwich and a cup of tea. The vision for that was very similar. When silly Lawrence was here. He was an absolute f*cking idiot wasn’t he? What I will say is, how he pulled off buying our football club is bordering genius. On one hand you’ve got this really clever genius, on the other you’ve got this complete car crash of a man. He was really odd. When he was here, people were resisting him and were negative towards him and they were doing things that were harming the football club, in my opinion. He’s our owner, what can you do, well what you can do is try and manipulate. So for instance, my massive dream was to make that pub into a supporters’ venue where everybody could go, even non match days, a haven for Watford supporters. I was pitching that to him. He wanted to make it a strip joint, a pole dancing club. I really battled with him over that. In the end he just told me to get on with it. I wasn’t to know it was going to implode so quickly after we’d set it up. It came out what he’d been doing and what he’d not been doing, nicking the money out of the snack bars and stuff, we all knew that. Perhaps I’ve got rose coloured glasses and I’m looking back to 1989, but the fans for me are what Watford’s about. Engaging in the community, it’s what we did, and I think it’s lacking. My idea was good prices in the pub, memorabilia. I even got the old Rookery clock and put it in the museum. Perhaps I was being idealistic. I thought we could get subscriptions and you could become a member for five pounds. We could have a committee with all sorts on it, supporters and players, make it a nice venue. Now it’s flats. Do you have any dealings with the 1881 at all? No, I don’t know anything about that. It was after I stopped working for the club as a full time worker, about four or five years ago I think. I know they’re in the little bunker down the bottom but I don’t have anything to do with them because I don’t know the people. I know they’re trying to do the same thing aren’t they? It’s a shame because we all love our football club. I look back and I’m really pleased with what we achieved. I always forget the guy’s name, but we got this 90 year old former player on the pitch, he’d never been back to the club since he left, he played two seasons just after the war. That man was in tears on the pitch. He brought his whole family with him and we wined and dined him a little bit. He died two years later, and they came up to me and Graham and they said we’d made his life. It still brings a little lump to my throat, to think that we did that for him. We played a couple of memorial games, for a little trophy, all for their charities. I went to his funeral. I just think we should be doing that. We did that on no money. Wouldn’t it be nice if we did that on a regular basis. I know we’re all of different ages, but all of our memories are Watford related aren’t they? I only played about 13 or 14 first team games but I had about eight years at the club. It’s part of my life, part of my childhood and early adulthood. You ask people of a similar age to me and they’ll have slightly different memories, but the same passions and the same thoughts. I have Steve Sherwood come to my house, we’re good mates. He loves coming back. All the lads love coming back. I got invited to the end of season dinner with some of the boys to do the Tom Walley thing which was lovely, and quite rightly so for Tom. Trevor Steven, I've got to say him. But I should have smashed the living daylights out of him in the first fifteen minutes! I supported West Ham. My family are all from the east end of London and they got bombed out after the war. My cousin is Danny Dyer, and my Dad used to take me with Danny’s dad to watch West Ham. But when I went to Watford, that all changed. Ford Cortina Mk IV 2000E. Brilliant car. Walnut dash, full sunroof, I was 17, had it four weeks and I smashed it up! My kids would say Love Island, what a load of .... that is. I would probably say historical documentaries. Anything to do with British history.